Hey there everyone! 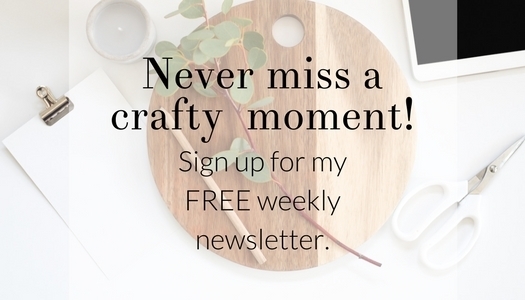 I’ve got a craft to share, and it may even help you get organized. What?!? 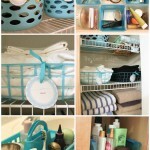 Crafting and organizing all at once? 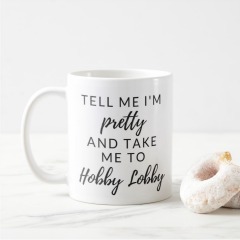 Sign me up! I have to admit that my paper clutter has gotten out of control lately… to-do lists, post-its, receipts, mail. I just can’t keep up. I decided a clipboard would help keep my to-do list in check, and if the clipboard was cute and colorful I might be more inclined to work on that list. The Dollar Store is my go-to place for basic office supplies. I snagged 2 clipboards (I made one or my mom). Since everything else came from my craft stash, this was literally a $2 project. $2 and the better part of nap time. That’s it! Paint the edges around the clipboard white (or whatever color you would like). 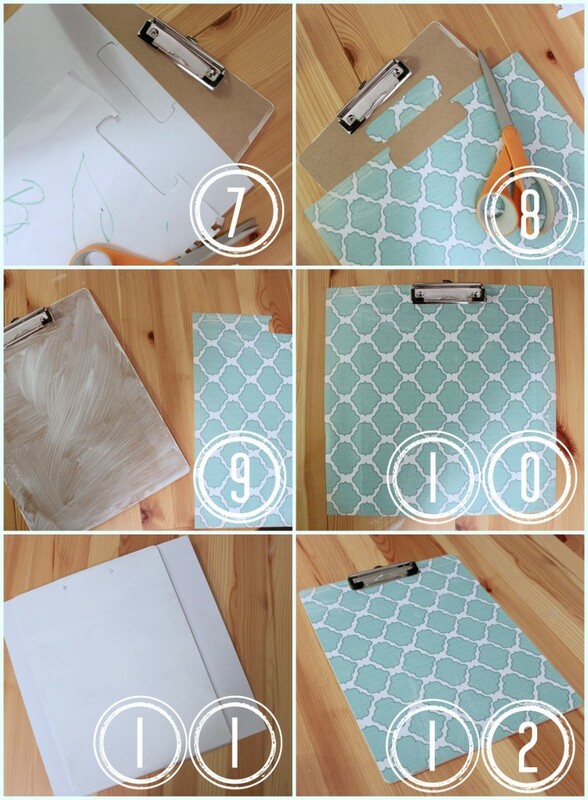 Paint the whole back of the clipboard a solid color. Let dry. 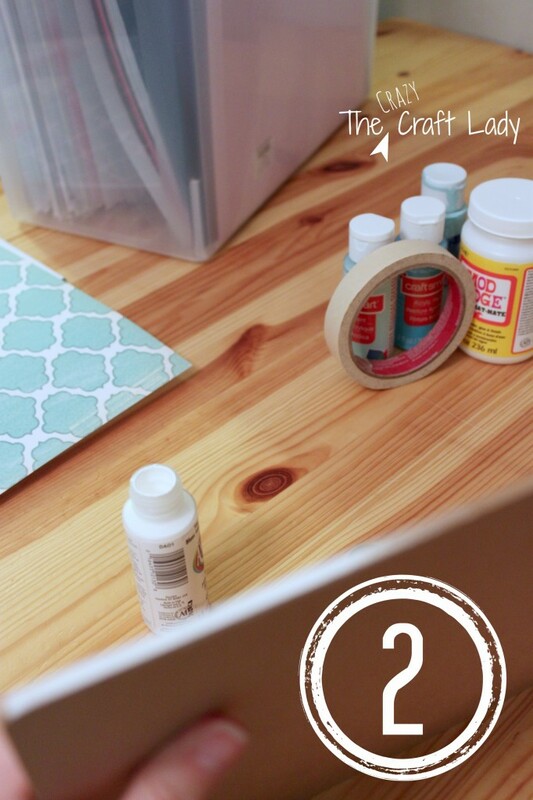 Apply masking tape to the back of the clipboard – whatever design you would like. Paint inside the tape. Don’t let the paint fully dry. While the paint is slightly tacky (not completely dry), peel off the tape at an angle. Allow paint to fully dry. 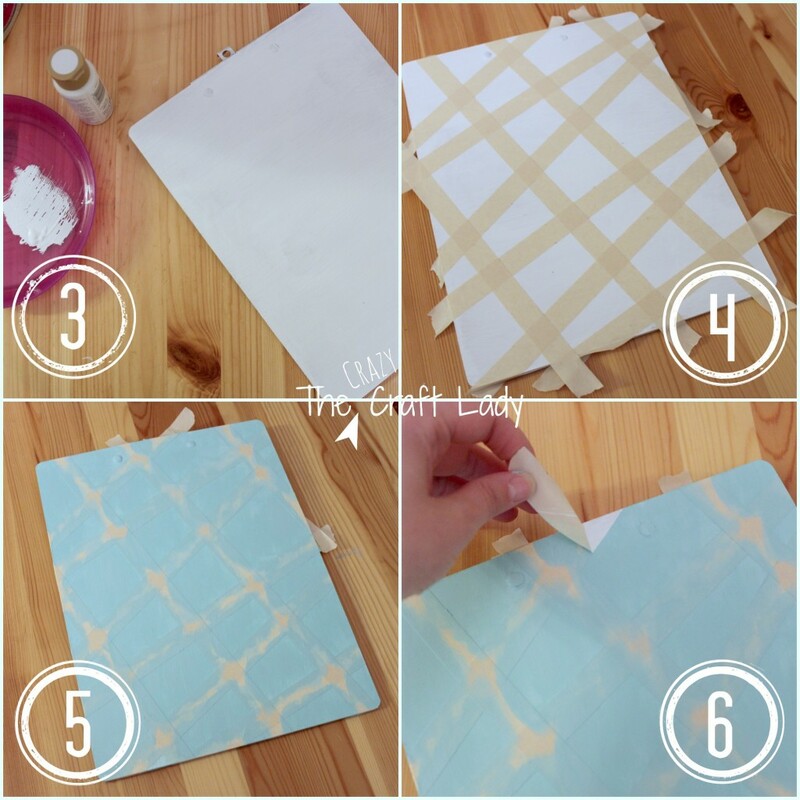 Apply a thin layer of Mod Podge and allow to dry. Flip over the clipboard. Using scrap paper, trace an outline around the clip of the clipboard. Trace the template onto the back of your scrapbook paper. Cut out along the outline of the clip. 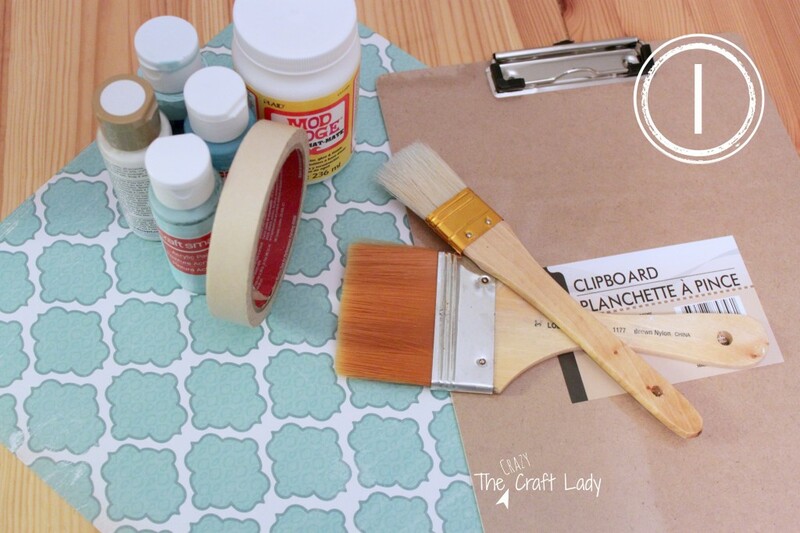 Apply a thin layer of Mod Podge to the front of the clipboard. Place the scrapbook paper down over the wet Mod Podge and smooth out any wrinkles or bubbles. Wait 15 minutes to allow the Mod Podge to dry. Flip over the clipboard. 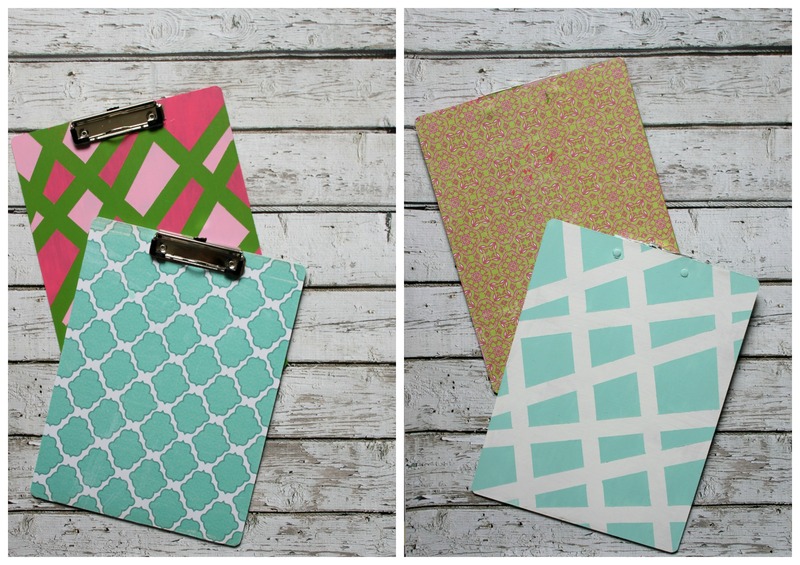 Trim away any excess scrapbook paper. Apply a thin layer of Mod Podge and allow to dry. This is so cute. My 3 year old son would love this. He is always trying to be like me and make lists. I made him a homemade clipboard with cardboard and a chip clip. He gets it out and walks around drawing saying he is making lists. 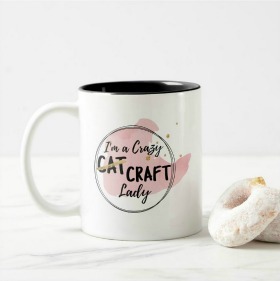 I will have to make a few of these. Awesome! 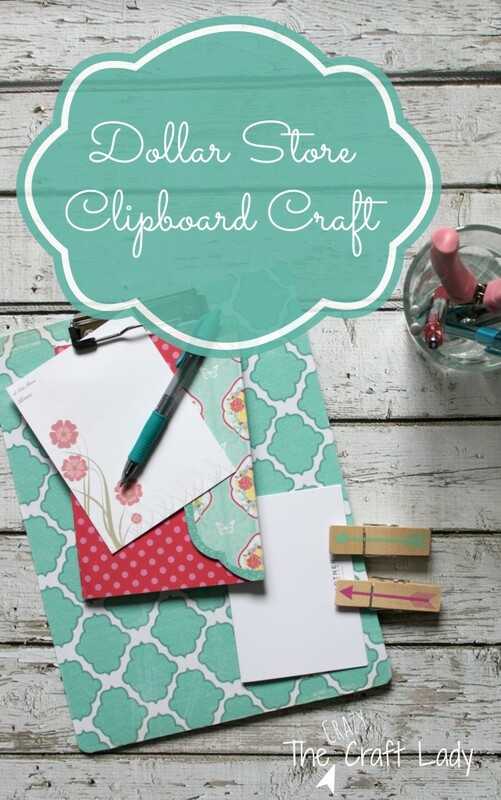 I love it … and I bought one of these clipboards recently because I couldn’t resist and I knew I would have a use for it! These are so cute! I love decked out office supplies. I am always more productive when the things on my desk are pretty! This is a great idea. I love the dollar store, too. I love this idea! 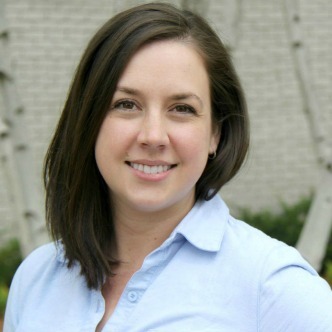 Lately I have been presenting social media workshops and hand around a clipboard for email collection. I think this would be great and affordable to do. I think rather than using Scrap Book paper I am will print my logo on quality paper replacement! Nothing like taking branding to the next level! Thanks for sharing! That is such a great idea! Thanks for the kind words. I should do this and use the clipboard on the days I don’t need the whole 3 ring binder. I love the effect you got with the tape. This is great! I love anything that involves the dollar store. I also have piles of scrapbook paper that could be used on this. I recently took a clipboard we had and stained it, so I think I’ll add scrapbook paper to that back! Very cute! I have an ugly clipboard that I carry around with my crochet patterns…ugly mess! 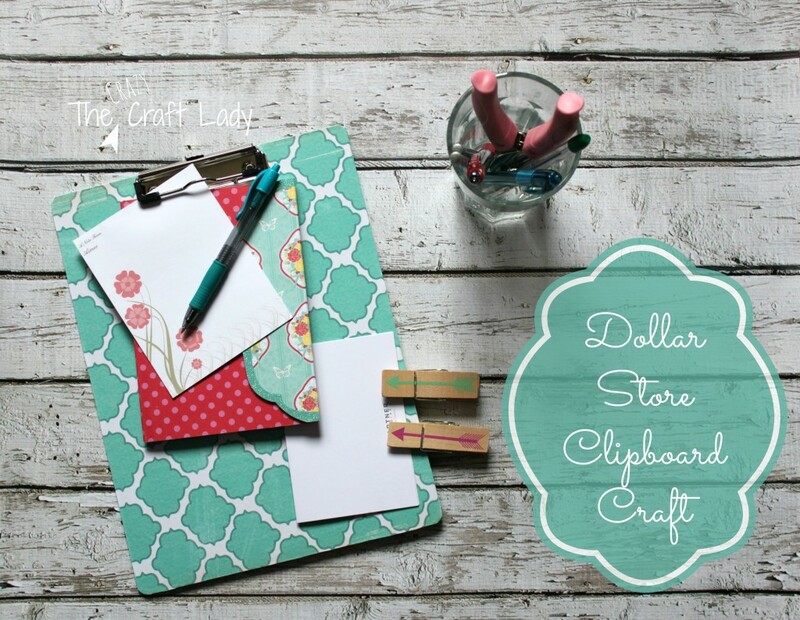 I think I just might dig into my ginormous scrapbook paper stash and try this! 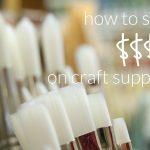 I love Dollar store crafts – great share! Hopped over from Katherine’s Corner, happy Thankful Thursday! Great share love the ideas! The teacher in me is screaming yes… I love it! Thanks for stopping by the WYWW link up! Very cute! Love the back, too! Thanks for linking up to What You Wish Wednesday. Come back on Wednesday! 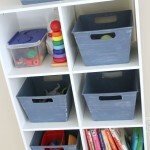 SOOO Cute and easy, I need to make these for my classroom! I just duct tape everything which can get a bit tacky 🙂 this is adorable. 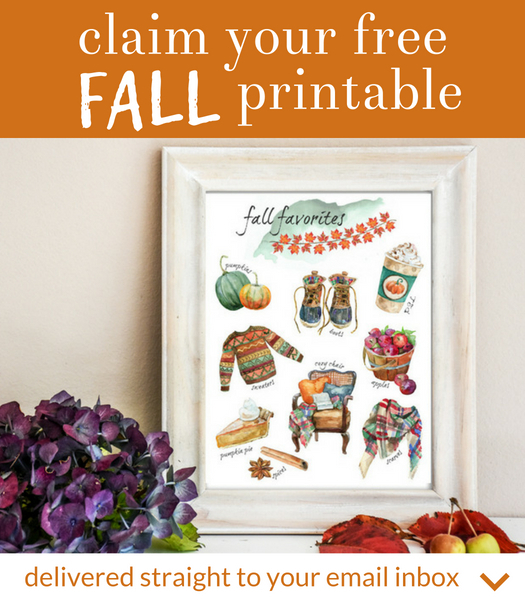 Thanks for linking up last week to Friday Favorites, hope to see you this week too! I love the scrap book paper you choose! And I’m smitten that you painted the back of the board as well as the front. Perfect way to class up a dollar store purchase!! Thanks for linking up with Creative Spark! So glad you like it Asha!